Unicorn Training is delighted to learn that the Insurance Institute of Ireland’s (III) first ever online learning and development platform, iiiConnect, has been shortlisted for a prestigious eircom Spider Award in the Best Education Website category. The III, the leading professional and educational body for the insurance industry in Ireland, has launched iiiConnect – hosted on Unicorn’s highly-intuitive, collaborative Web 2.0 learning management system SkillsServe - to 14,000 members in firms across Ireland. iiiConnect is the result of a collaboration between the III, Chartered Insurance Institute (CII) and Unicorn to provide eLearning to the Irish insurance market. The aim was to deliver an excellent learning experience to the III’s members, giving them greater flexibility in training and educational services and tailoring their learning to fit their schedules, whilst establishing the III as the primary provider of training and development in the Irish market. The eircom Spider Awards are considered Ireland’s most prestigious online awards celebrating Irish internet excellence, and the results will be announced at their annual awards dinner on November 10. Unicorn Consultant, Helen Watts, explains. iiiConnect enables its members to complete their studies, maintain CPD compliance and advance their careers in line with the III’s vision of a community where professional excellence and the highest ethical standards provide career and personal fulfilment. For pre-qualification members, a specifically-tailored, suite of engaging, interactive eLearning, personalised study routemaps, exceptional event management tools, iiiConnect’s Knowledge Sharing Environment, webinars and exam test papers and quizzes provide comprehensive pre-exam support. Meanwhile, the updated Minimum Competency Code (MCC) dictates that, as of 1 December 2011, Irish insurance industry employees must annually complete 15 hours CPD to retain their designation. 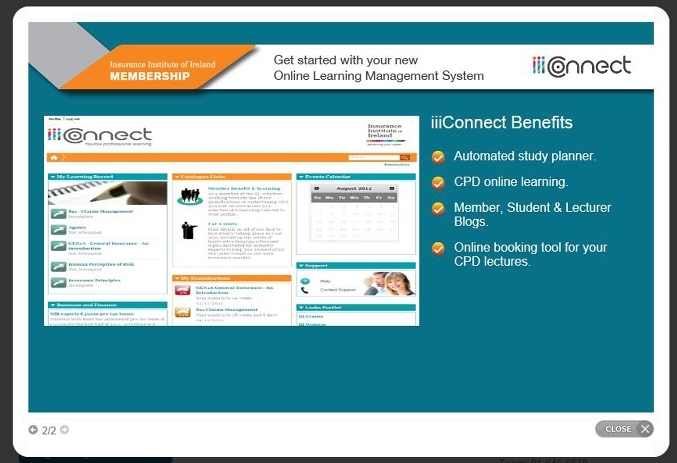 iiiConnect incorporates sector leading CPD functionality. This functionality not only includes access to CPD accredited eLearning but students can manage event bookings and download lecture powerpoints, keep up to date with the latest industry news, get help from subject matter experts and share their study experiences with other students through a wide range of diverse learning tools and resources. iiiConnect integrates with III members’ PSAB-GI (Professional Standards Advisory Board – General Insurance) CPD compliance management portfolio. Both Face to Face and eLearning CPD lectures attended by members are automatically logged and recorded in each student’s PSAB-GI CPD portfolio.